Canine Rescue Stories: Helping or Hindering? We all want to try to help, so we spread the word to everyone we know via places like the Tripawds Rescue Forum or Facebook page. Oftentimes, like in the case of Tripawd Miles, a success story happens and the dog finds a furever home. Sadly, oftentimes we’re not quite sure whatever happens to other rescue dogs. We all want to do what we can to help dogs find homes, but Tripawds just discovered that sometimes our good intentions can lead to confusion that hinders the process. We recently learned from a friend who heads up a rescue organization, that many of these “last minute” dog-on-death-row alerts aren’t always what they seem. Many times the dog isn’t actually on death row, but in our enthusiasm to help, we give people that impression. Rescue stories often end up being passed around like the telephone game, with the facts becoming so mixed up that it’s hard to get the facts so the dog can be helped. A call out went all over the web, and people were desperately trying to help spread the word, including us. After reading about him, a Tripawds friend who leads a German Shepherd Rescue Group did some investigating to try to help. He learned that the name of the shelter the dog was supposedly in was wrong (the dog was actually in Florida, not California), and the dog was in no danger of being euthanized. After learning this, we wondered how we had missed that little fact in the earliest posts on Facebook. The dog was up for adoption and the shelter was doing all they could to find him a home. All the calls and emails they had been answering from well-intentioned folks were actually preventing them from getting their work done. Stories like this can circulate through the Internet for years. Many shelters still get calls about “Lab Puppies Found by the Highway Need a Home Now!” years after they were all saved. 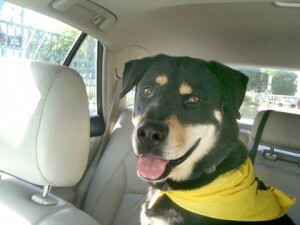 We think there really needs to be a “Snopes.com” for rescue dog stories! How authentic does this story seem to be? Does the original poster have some kind of personal connection to the dog? Did someone already pay for the dog’s medical expenses? Is the dog in a no-kill shelter? Does any of the information come directly from the shelter? Is there concise contact information about how to help? Can you think of any other ways we can do more good when trying to help? Thanks so much for posting this. I’m a little relieved to think some of the posts on animals who are not given more time by the facility they’re in may be inaccurate! I love your idea of a central location to verify the information!! If there was such a place, then one specific person from a group of volunteers (on behalf of the site/org that hosts it) could call the animal facility and speak with an official who can verify whether or not the information is correct, and the corrected or verified info. could be posted and updated on the site. I can understand that many shelters and facilities would not have the staff to handle a large number of calls and emails (unless the person is calling to adopt) and that extra calls and requests might interfere with their work on behalf of the animals. Thanks, as always, for the work you do on behalf of animals (and their people)!! Shahrzad, I would love to see this centralized adoption resource happen too. I can see many more animals finding forever homes a lot more efficiently that way. Good things to remember….maybe if we get the information, before posting it, a phone call to the shelter in question could clear up the confusion? I think it might help before clicking that “send” or “post” button!